In this day and age, with all of us active on social media, our data usage can get out of hand. To address this, Facebook is testing a version of Messenger that use a lot less data. You may think that social messaging doesn’t use much data. You are wrong to think that. Messenger in particular, is a data-hungry little fellow – not to mention a power-hungry one as well. Because it’s not just the messages. Those are just text. Just think about all the GIFs, images, attachments etc., that you send or receive on a day-to-day basis. If you don’t have an uncapped unlimited data plan, Messenger on its own may cause you to leak data at an alarming rate. For this, Facebook has a solution. 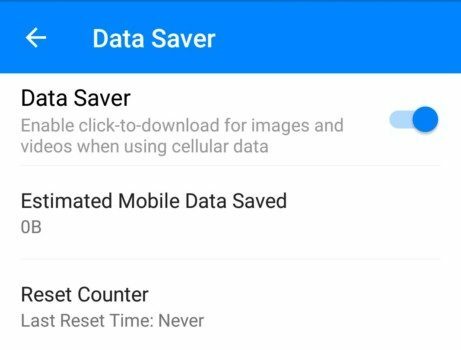 The company is testing a new Data Saver feature on Android, which makes Messenger a lot lighter on its data-usage. When activated, Data Saver kicks in only when a user is using a phone’s data and not wi-fi. So if you’re really into your multimedia, it should make a difference to your usage. To see the content, all the user has to do to is tap on it to view it. This doesn’t apply to text messages by the way. Finally, Data Saver also offers a counter so that users can see how much it is saving them during a specific time-period. They can reset whenever they like. You can take part in the Beta by signing up here. This move comes amidst similar ones to make apps less reliant on data, so that users around the world can have a more consistent experience. We may be in 2016, but social media users are spread far and wide, and data connections are not a universal given. Even YouTube and LinkedIn are in on this trend, with recent launches of special apps for users in India.